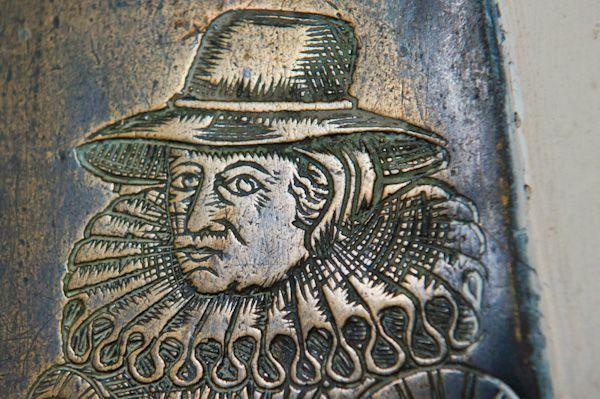 HERITAGE HIGHLIGHTS: Wonderful Saxon font, D'Oyley memorial, and 16th century Wolsey Altar. 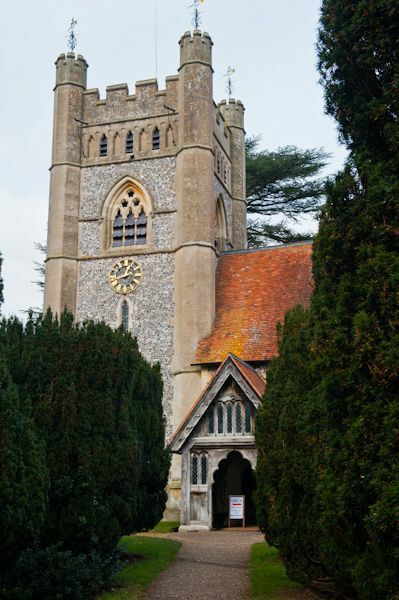 This lovely medieval church sits in a glorious countryside setting within one of the prettiest of the Chiltern villages. The first church here almost certainly predates the Norman Conquest, as evidenced by the beautifully carved Saxon font near the south door. The living was granted to Queen Matilda, wife of William the Conqueror, and was later held by King John in his role as Earl of Gloucester. 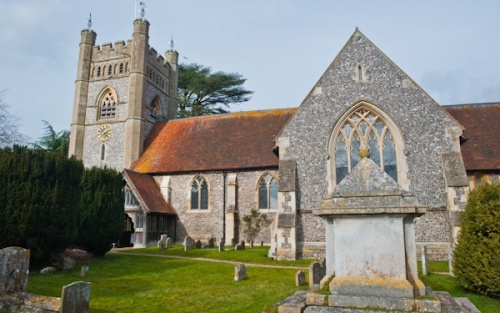 The first known rector of Hambleden church was Ralph Neville, in 1215. Neville was also Chancellor of England, and later became Bishop of Chichester and, controversially, Archbishop of Canterbury. Controversial because the Pope refused to sanction the appointment, saying that Neville was 'a mere secular courtier, hasty in speech and haughty in spirit'. A much more positive Hambleden association was St Thomas de Cantilupe, born at Hambleden - probably in the Manor House - in 1218. 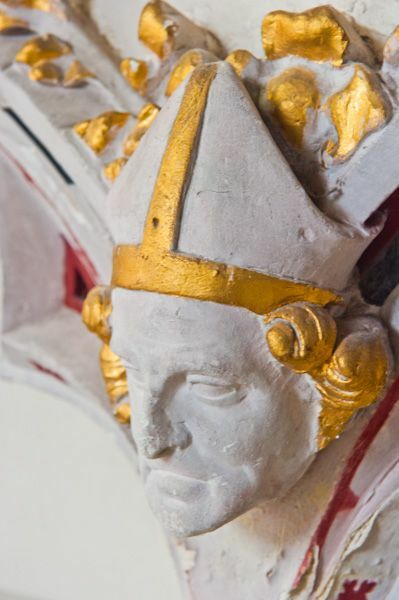 Cantilupe rose to become Chancellor of England and Bishop of Hereford, and in 1320 became the last English saint to be canonised before the Reformation. His bones were held in St Mary's church until a shrine was built for him in Hereford Cathedral. The living of Hambleden was for some years in the possession of Bartholomew de Badlesmere, but Badlesmere made an enemy of Queen Isabella, wife of Edward II. She had the nobleman executed, and in time the living was granted to Hugh le DeSpenser the Younger, favourite of Edward II. DeSpenser was himself executed in 1326 and Edward III returned the living to Bartholomew's wife, Margaret de Clare. For over 2 centuries the manor and church were in the hands of the Scrope family. Charles II was later a patron and gave the living to his own chaplain, Dr John Lloyd. 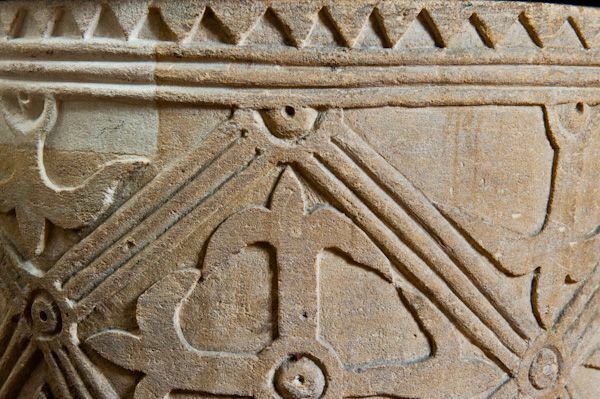 Almost the first thing that meets your eye on entering the church is the beautifully carved Saxon font. 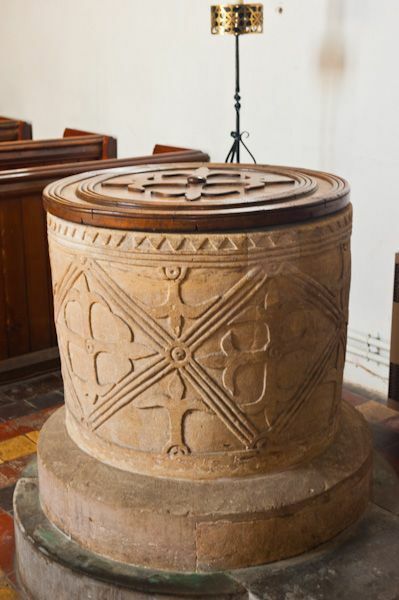 This is in simple tub style and is almost certainly the font in which the infant St Thomas de Cantilupe was baptised. Within the tower is the fanciful Elizabethan monument to Ralph Scrope (d. 1572). Scrope's wife was Elizabeth Windsor, whose first husband was Henry Sandys (d. 1555). An impressive memorial to Sandys is on the north side of the chancel and was probably adapted from an older Easter Sepulchre. 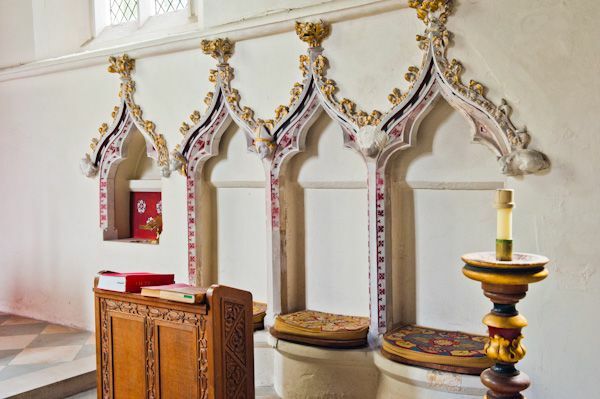 Also in the chancel, facing the Sandys memorial, is a magnificently decorated three-seat sedilia dating to the 14th century. A wonderfully preserved moulded string course covers the sedilia and an adjoining piscina, all of 14th-century date. The oldest part of the church is the north transept, and here we find the gem of Hambleden - the D'Oyley memorial. 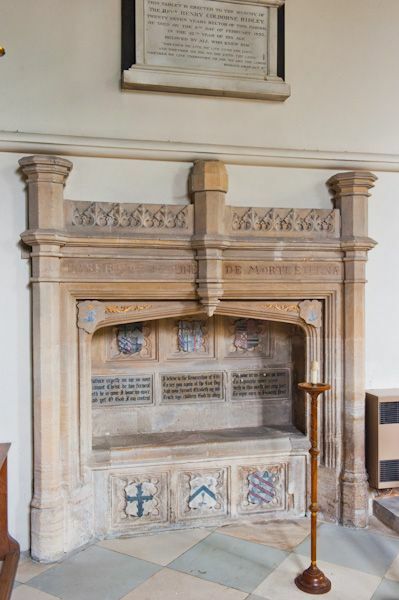 This magnificent memorial is to Sir Cope D'Oyley (d. 1633), his wife Martha (d. 1618) and their 10 children. In traditional Jacobean fashion, the couple is portrayed kneeling, facing each other, with smaller effigies of their offspring similarly arranged below them. Note that some of the children carry skulls, an indication that they died before their parents. The effigies were originally painted and gilded, and though much of the paint has worn off, enough of the gilding remains to give an idea of just how colourful the monument must have been when made. On the memorial is a poem to Lady D'Oyley; the verse has been attributed to Francis Quarles, Lady Martha's brother, a well-known poet. Beside the D'Oyley memorial is a small muniment chest used by James Brudenell, Earl of Cardigan. It was Cardigan whose 'leadership' was so soundly castigated by Tennyson in his immortal poem The Charge of the Light Brigade, and this same muniment chest was almost certainly used by Cardigan at the time of that fateful charge. 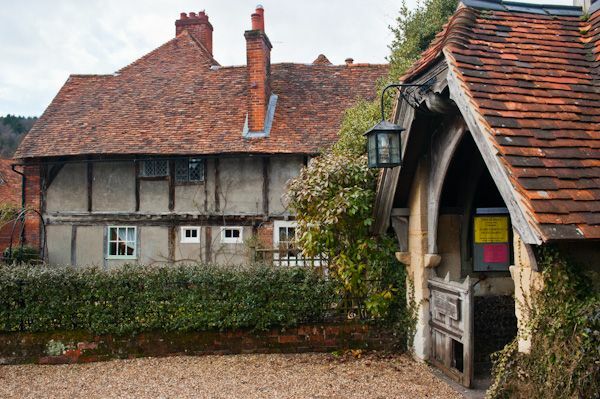 Brudenell was born at the Manor House in Hambleden and baptised in the Saxon font here. Cross from the north transept to the south, and you will find the other major historical treasure of St Mary's church; the Wolsey Altar. 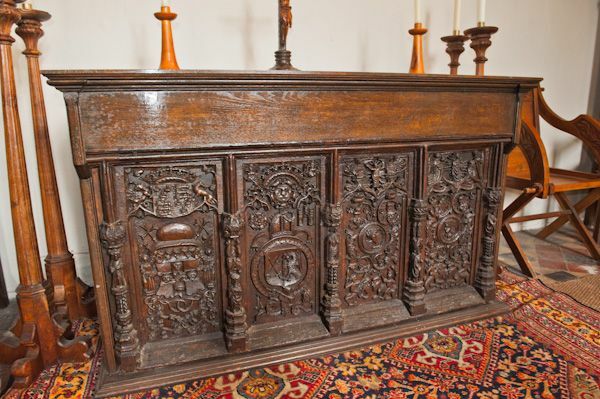 This is a wonderfully carved oak altar of 16th-century date. 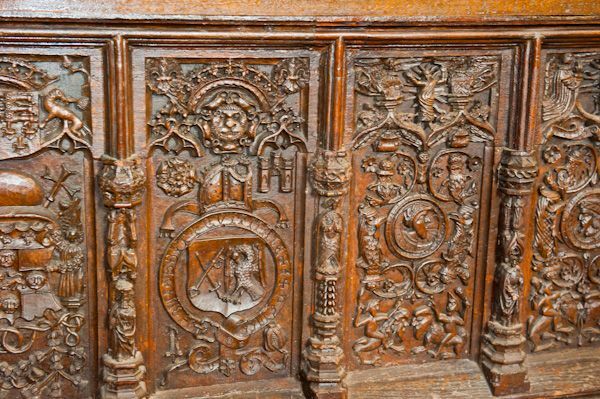 The front panel is marvellously carved, probably by Dutch or Italian woodcarvers, and it includes the arms of Cardinal Wolsey and Bishop Fox. The altar frontal was originally a bed head belonging to the Sandys family of The Vyne at Basingstoke. Wolsey, Fox, and Henry VIII were known to visit The Vyne, and the bed head probably migrated to Hambleden when Elizabeth, widow of Henry Sandys, married Ralph Scrope, as mentioned above. 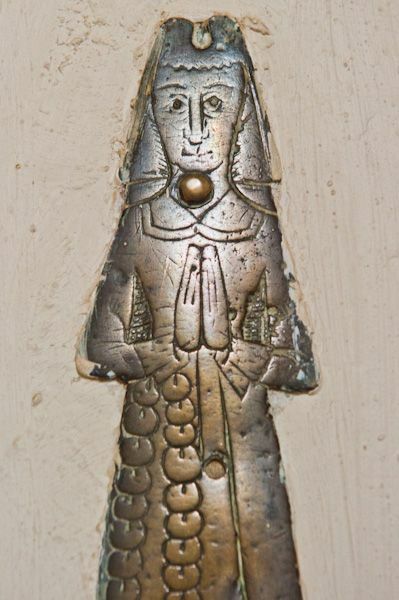 In addition, there are 8 small brasses in the church, the oldest being that of John and Joan Shipwash (1457), in the north transept. Also in the transept, rather obscured by a jumble of furniture when we visited, is a very large stone Saxon coffin, set on its side. One final note - on the south wall of the nave is a small brass plaque to WH Smith, the famous bookseller. 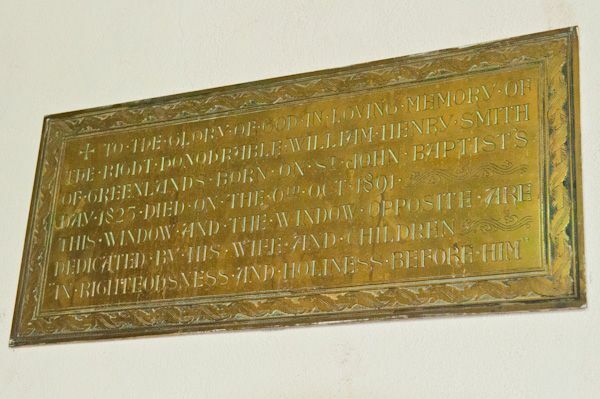 Smith was a churchwarden at Hambleden and his family paid for the plaque and two facing stained glass windows in his honour. Smith's grave is in the churchyard. St Michael's is a gem; a delightful church in an absolutely marvellous setting. The church is open most days and is well worth an extended visit. Location: Off the A4155, in the centre of Hambleden just off the green. There is a free car park, well signposted from the village centre, about 2-minutes walk from the churchyard.